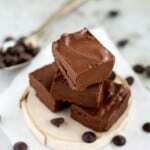 Home » Dairy Free » 3 Ingredient Dairy Free Fudge. 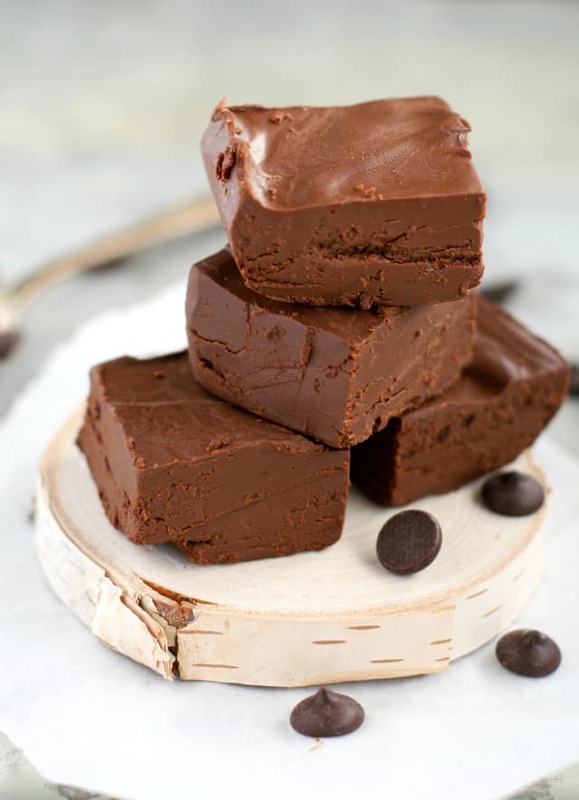 3 Ingredient Dairy Free Fudge. 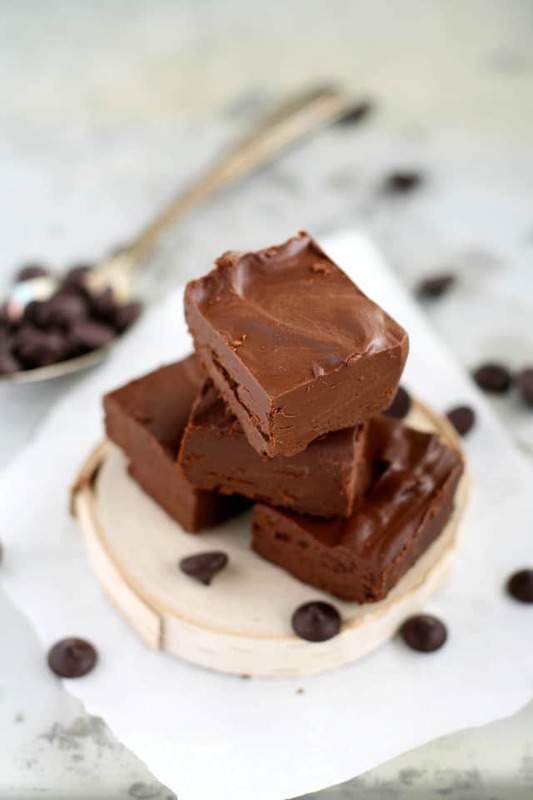 Creamy, dreamy, three ingredient dairy free fudge. This recipe is the perfect way to indulge your holiday sweet tooth! Every once in a while, I ask my readers what recipes they really miss now that they are gluten/dairy/nut/egg/whatever free. One of the last times I asked, I had a reader on my Facebook page share that she really misses fudge, and that she thought it was impossible to make a good fudge without dairy. Well, I love a good challenge, and after a few tries, I came up with a recipe that’s super easy – it only requires three ingredients! Easy dairy free chocolate crunch bars are a kid friendly favorite! This fudge is decadent but not overpoweringly sugary and sweet. When I’ve eaten normal fudge in the past, to me, it was too sweet. The sugary quality was a bit too much for my taste buds. 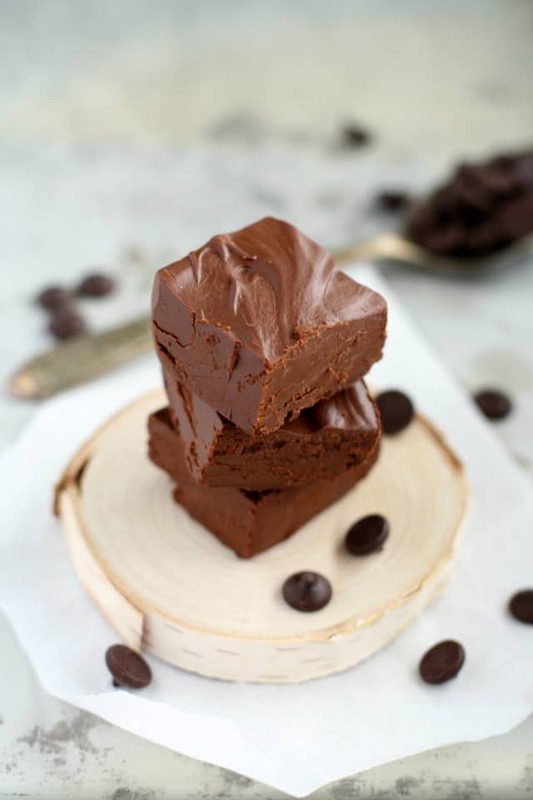 This dairy free version is everything I think fudge should be – rich, creamy, melt-in-your-mouth, and very chocolatey. I remembered that sweetened condensed milk is often an ingredient in easy fudge recipes, so I wanted to come up with a good substitution for that ingredient. I found that using full fat coconut milk and whisking in some powdered sugar worked very well. I’ve tried this recipe with various brands of coconut milk, and it really works the best when the coconut milk has guar gum in it, like So Delicious Culinary Coconut Milk or Taste of Thai brand. The gum seems to help the fudge solidify and hold its shape better. It will not set up right when you use a coconut milk without gum. I prefer a dark chocolate fudge, so I did use dark chocolate chips (the 85% bittersweet chips from PASCHA). Some chocolate chips contain extra oils and more sugar, and I do not know for sure how they would work in this fudge. The darker the chocolate the better. UPDATE: I have made this a few different times now with varying ingredients. 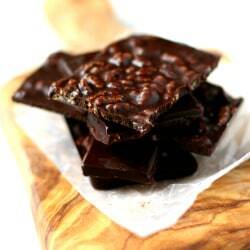 This recipe DOES work with the PASCHA chips I mentioned above, as well as the Enjoy Life Dark Chocolate Morsels. It does NOT work with the Enjoy Life Mini Chips. Other readers have confirmed that milk chocolate chips do NOT work. I use Taste of Thai brand coconut milk. It has worked everytime I used that brand. I also use powdered sugar from Whole Foods or Target that is made with tapioca starch, not cornstarch. I don’t know if that makes a difference, but we avoid lots of corn in our diet, so that’s what we have in our pantry. (A reader confirmed that she made it with powdered sugar with corn, and also with tapioca starch, and the pan using cornstarch powdered sugar did NOT firm up). Another tip: You must line the pan with parchment paper if you want to be able to remove the slab of fudge and cut it into neat squares. If you deviate from these specific ingredients, you will probably not have success with this recipe. You can’t use any other type of plant based milk. You can’t use melted chocolate bars. You can’t use regular sugar. If you try those substitutions, please know that your dairy free fudge will likely stay liquid and will not firm up into fudge that you can slice. 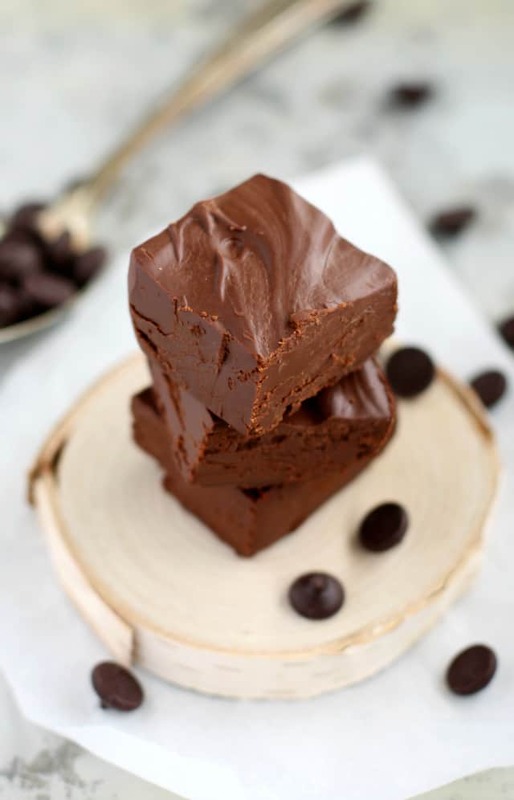 Deliciously simple dairy free fudge recipe. This is the perfect no-bake treat for the holidays! Line an 8x8 inch square pan with parchment paper so that there is an overhang on two sides. If your can of coconut milk has a lot of excess liquid on the top, pour that out before proceeding. Place the coconut milk in a sauce pan and heat over medium low heat, just until it starts to stem a little bit. Sift in the confectioner's sugar and whisk to combine. Do not overheat or boil. Add the chocolate chips and stir well until fully melted. This will happen quickly, don't burn the chocolate. Do you have a favorite recipe that you’d like to see an allergy friendly version of? Let me know in the comments! Follow my Dairy Free board on Pinterest for more recipe inspiration! 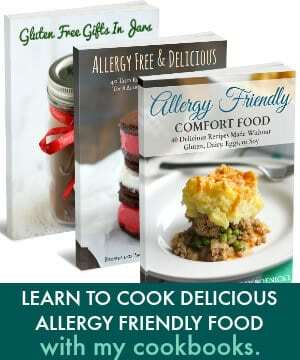 Follow The Pretty Bee (Allergy Friendly Eats)’s board Dairy Free Food and Recipes. on Pinterest. « Chocolate Chip Oatmeal Cookies with Fresh Cranberries. I would love to have a dairy, egg, soy a d wheat free thumb print cookie. ? So glad that it was a hit! Thank you for letting me know! Love this recipe, I used enjoy life 69% cacao so I didn’t add any sugar. I’ve made them twice, one with walnut and once with natural peanut butter swirled in. My bible study devoured the peanut butter one I took to class. They have been a hit every time i share with others. Thank you for this simple healthier recipe. I might try to add sugar free crushed peppermints for Christmas next. That’s wonderful to hear! Thank you for letting me know! Hi!! Super excited to try this! I noticed Taste of Thai has two full fat coconut milks – one line is called Taste of Thai Kitchen (in a black and red can) and one is in a yellow and green can. You were very specific about this being the coconut milk that works so I wondered if you could specify which of the Taste of Thai coconut milks you used:) Thanks! I made this with regular powdered sugar that contained cornstarch and it worked great. Very creamy. I was very excited to try this out so I gathered the ingredients and made it. Following the ingredient list and instructions exactly, I noticed a few things. I noticed that it needed more sugar (for my taste) and also, it was too liquidy, so I added more chocolate until I ran out, I added 5 cups of chocolate chips before I ran out. My advice to others is that you limit how much coconut milk you add in the beginning, add little by little so it’s spreadable. The whole can made it way too soft, was like ganache. Will try again with my changes in liquid. I am so disappointed as I tried to follow your recipe to the T. Mine turns out like thick chocolate moose. I don’t know where I am going wrong. I am in Australia but was able to get the True Thai coconut milk. I followed a recipe for the confectioners sugar, and I used dark cooking chocolate. Help, this seems like such a great recipe. I’m sorry to hear that! How did you make the confectioner’s sugar? Hello Kelly, the pictures look delicious indeed. I made one batch this morning. I was face with some challenges so early in the morning.I live in Québec, Canada and the coconut milk can is 400ml. Ok a converter gives it at 13.526 oz. The chocolate Enjoy life 69% cacao is called Chips/pépites and a bag is 255 grammes or 9 oz. So, as 3 cups equal 24 oz., I would need 3 bags for this recipe. I had one bag so I completed the 3 cups with all the chocolate chips I had. I hope it will taste as good as it looks because it will be the most expensive desert I made so far. 3 bags of chocolate chips 21$, one can of coconut oil 3.75$ on sale. 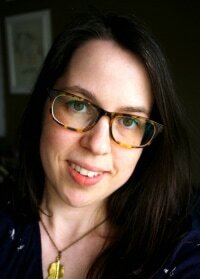 Ps: quantities in weight an option? I made this but it doesn’t stay firm once frozen? I couldn’t use chocolate so infused with cacao nibs – is is the chocolate that makes it stay together? It just melts when I take it out the freezer! Chocolate is a really key ingredient, since it firms as it cools, it has to be included. Cacao nibs will not work. This was so delicious! Tasted just like classic fudge, but even more decadent! My MIL is allergic to all red meat and dairy and she went crazy over this fudge! The only thing I would definitely do is get the powdered suger with the tapioca starch because I used powdered sugar with cornstarch and my fudge never set up to cut into neat, solid squares. Even after refridgerating and trying in the freezer for awhile it was still more of a creamy soft consistency, but still so yummy! Thanks for the great recipe! So glad it worked out for you! That’s really interesting and good to know about the tapioca starch! I hadn’t thought about the corn starch being a problem. Any recommendations on what to do with a fudge that didn’t set? I used regular powdered sugar bc it’s all the store had. Its almost the consistency of s really firm peanut butter. I’m sorry that happened to you! It could be the chocolate chip brand or the coconut milk. I read the ingredients for the 3 ingredient fudge recipe. Is there a substitute for the coconut milk? I am just concerned because I have a family member with tree nut allergies. I heard that coconut and/or coconut products/oil may not be safe for people with tree nut allergies. I would rather be safe than sorry. Does anyone have any suggestions? If you can do dairy, heavy cream may work. No other dairy free milk will work though. One comment would be to just use the cream from the coconut milk and some of the fluid rather than all the fluid as it takes an absolute age to condense. Otherwise very tasty. Good tip! If the can of coconut milk you have is very liquid-y, you can drain some of it off. I made this dairy free fudge today and it set in the fridge for about two hours till I put it in the freezer for five. It will not set up! I even used the coconut milk with the special gum. I’m sorry to hear that. What brand of chocolate chips did you use? Hi! For long can u keep it before it goes bad? You can keep it for a week in the fridge, but you can also freeze it. I have a son with tree-nut allergies. I like your 3-ingredient fudge recipe. However, I am concerned about the coconut milk. The FDA also considers coconut a possible allergen for people allergic to tree nuts. Is there another non-dairy milk that I could use? If so, what size container? I also want to make some vegan christmas cookies as well. But if you ARE allergic to coconut, or your allergist has advised against consuming it, then this recipe won’t work for you. As far as the vegan Christmas cookies go, if I have stated to use coconut milk, most likely any non-dairy milk will work just fine – for example in the batter or in a frosting. Please feel free to ask me about any specific cookie recipe if you have questions, I’m happy to help! Does this fudge have a coconut taste to it? Just very very slightly – it isn’t overpowering at all. Great! Let me know if you have other questions. I was wondering if peanut butter would work as a substitute for the chocolate chips? Peanut butter fudge is my weakness. I haven’t tried that, so I’m not sure! I think I would maybe do half peanut butter and half chocolate chips if I was going to give it a try. Sounds like an awesome recipe, and I can’t wait to make it for a lactose free friend. But in Australia I can’t get the chocolate chips you’ve used. If I used a block of 85% dark chocolate what weight/quantity would I need? I’m unsure, I’m sorry! I would guess that you could grate the chocolate and then measure it with a cup measure. Could you use normal milk instead of coconut milk? Or maybe condensed milk? I really don’t know, I’m sorry! Maybe condensed milk, but isn’t that sweet? You may need to reduce the sugar. I can’t wait to try this! Do you need to refrigerate the coconut milk to let it separate at all, or can you just dump the whole can? Can you please send a whole box of these to my house?! YUMM!! 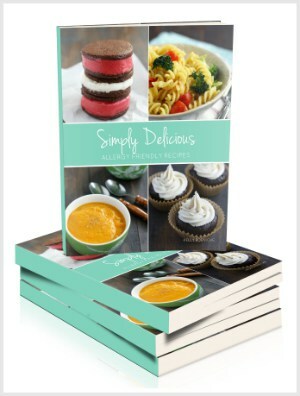 I love simple dairy-free dessert recipes! I tried this, I followed the recipe exactly and used the “Taste of Thai” full fat coconut milk and Hershey’s special dark chocolate chips and then put in in the freezer to cool it’s been in there for four hours but still hasn’t set up I’m not sure what went wrong, any suggestions? I just looked at the ingredients, and those chocolate chips contain milk and some other additives. The recipe does say dairy free chocolate chips, so I’m really not sure how those extra ingredients would change the outcome of this recipe. I’m sorry you had this experience! can i use condensed mild instead of coconut milk? Glad you found me on BuzzFeed! :) I think condensed milk would work, but I’m not sure because I haven’t tried it that way. i am so excited to see this…living in europe, chocolate chips are hard to get—but there is plenty of dark chocolate out there that i can break apart and use instead! thanks for this recipe! #momofallergykid #peanutfree #dairyfree YIKES! and YEA! Can I substitute the Coconut milk with coconut cream? mine turned out kind of sticky and not very firm. I added cornstarch and xanthum gum at the end but it didn’t work. Any sugestions? Hmmm, I haven’t had that trouble, except when I used coconut milk that didn’t contain gum. What brand did you use? I had the same problem. The only thing I did differently was use enjoy life semi sweet morsels. I followed the recipe exactly. Any suggestions? If it was the mini chips, I wonder if it would be due to the chocolate liquor, which is not contained in the Enjoy Life Dark Morsels, or the PASCHA bittersweet morsels. I’m sorry you had this experience! I have made this a couple of times now with no trouble and I am going to make it again this week for gifts. Just for my research, because I want everyone to be able to make this, what brand of coconut milk did you use? It was Thai kitchen coconut milk, which has the gum in it. Should I look for morsels without liquor in them? The taste was amazing but not hard at all. That would be my guess. But I did use the Taste of Thai brand milk, so maybe that is part of it. 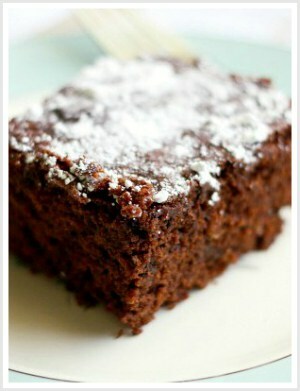 This looks so rich and fudgy! I love how simple it is to make! Will it work at all without the guar gum? My little has a legume allergy as well as dairy, so guar gum is out for us…. It will work but it may not be quite as firm. Can you have tapoica starch? If so, just try whisking in a teaspoon when you heat the coconut milk. That should help it stay firmer. Hi can i use cornstarch instead? The powdered sugar is what has the starch in it – most brands of powdered sugar have cornstarch, so yes, that is fine! Perfect, I am lactose intolerant and I can’t wait to make these!!! This looks amazing! I love that it’s so simple and I bet the coconut milk adds a really great flavor. I can’t wait to try this one! 3 ingredients?? say what!!!! yum! Instead of using confectioner’s sugar, I wonder if this would work by using coconut sugar that has been blended until it is powdery. I am going to try that. I wondered the same thing – please let us know if it worked! Since I made a chocolate cake, last night (a healthyish one, but still chocolate cake), I will need to wait a bit before making another dessert, but will post the results when I do. Great! Thanks! You may need to add a little cornstarch or tapioca starch when you grind the sugar, since that’s an ingredient of powdered sugar. It helps the fudge thicken. Let me know if it works! That’s a great idea! Oh yum! I want to eat all of these right now!! And I love that this recipe doesn’t use coconut oil, just the milk! I’ve always wanted to rekindle my love for good fudge! Perfect vegan goodness right here! This looks insanely delicious! And a great gift for a holiday party host too! Pinned! I can never resist fudge, especially when it’s only three ingredients. This dairy free version looks fantastic, Kelly! I think I could devour this entire batch!